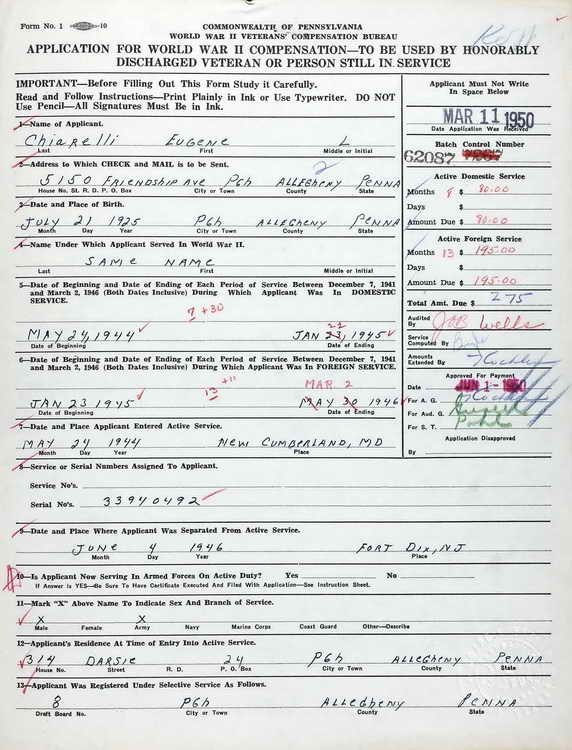 file by Eugene Chiarelli on 21 August 1950 indicates that he had 8 months of domestic service and 13 months of overseas duty. He was awarded $195 for his service. 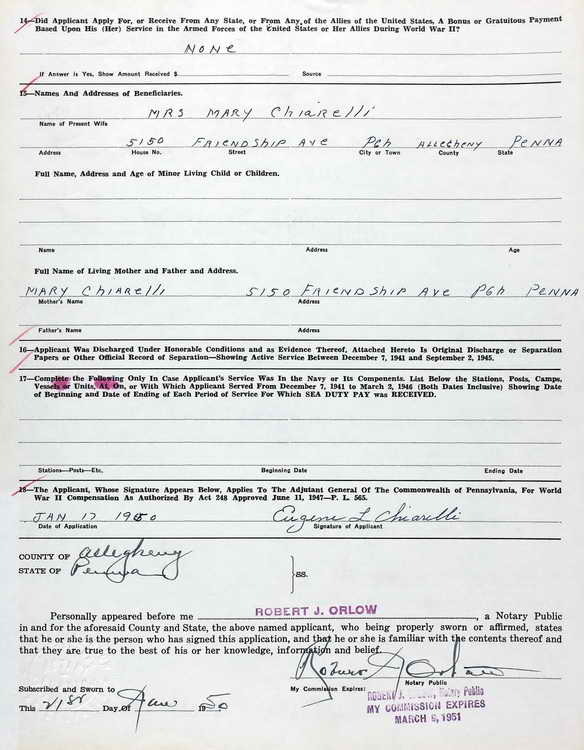 submitted by Eugene L. Chiarelli and Lydia Romito on 23 February 1950. Both indicated that their parents had been born in Italy making them each first generation Americans. Eugene and Lydia were married two days after their license application had been filed. Age 76, of Bloomfield, on Monday, Sept 10, 2001, beloved husband of the late Lydia Romito Chiarelli; father of Jean Chiarelli, Ramona Chiarelli, Eugene Chiarelli, Charmaine Chiarelli and Judy Chiarelli; grandfather of Douglas Mariani II, Lauren Loci and Al IV Buzzelli, Eugene II and Noah Chiarelli, Brian and Brandon Hensch and Richard Assaloe Ii; brother of Margaret Weligand, Helen Thomas and Dorothy Smith; loving friend of Mary Ruill, also survived by many nieces and nephews. The family wishes to acknowledge the devotion of nephew, Leonard Romito and brother-in-law Paul Smith. 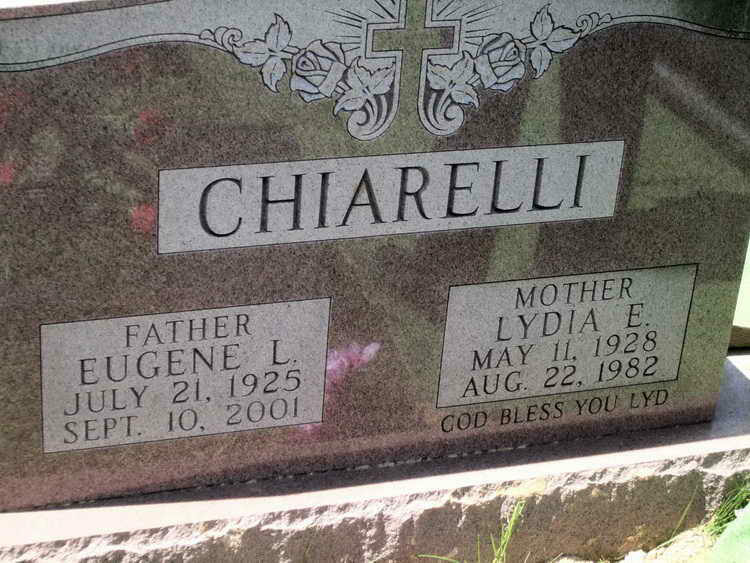 Mr. Chiarelli was a veteran of 101st Airborne, during WWII. He will be greatly missed by family and friends. Friends will be received Wednesday and Thursday, 2-4 & 7-9 p.m., at WINTER FUNERAL HOME, 4730 friendship Ave, where service will be held Friday 10 a.m. Grave marker for Eugene L. Chiarelli in Section: 28, Lot: 11-A, Grave: 1, Allegheny Cemetery, Pittsburgh (Allegheny county), Pennsylvania. 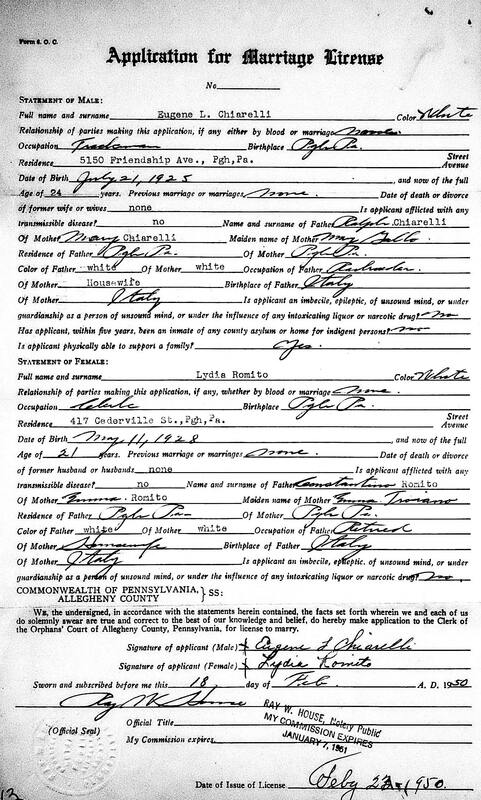 Eugene enlisted in the Army at New Cumberland, PA on 24 May 1944 and volunteered for parachutist duty. Following completion of jump school he was shipped out to the ETO on 24 May 1945, apparently as a member of he 101st Airborne Division. Whether he was used as a replacement during the Battle of the Bulge is unknown. By May of 1946 he had been transferred to Company G, 508th PIR as he was awarded a Good Conduct Medal while a member of that company.